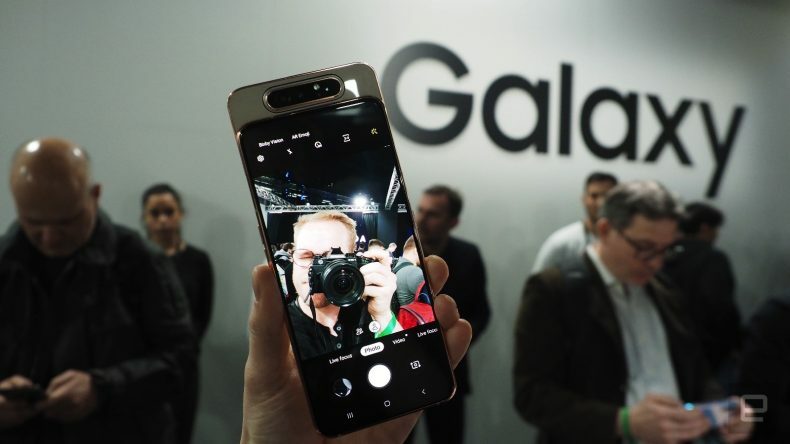 The Galaxy A80 body is a mixture of metal and glass exactly like the Galaxy S10smartphone. It has a 6.7-inch FHD+ new infinity display with 1080 ×2400 resolution. The bezel-less screen of the new smartphone holds a fingerprint scanner under it like the Galaxy S10. The phone system packs a 2.2.GHz (2.2GHz Dual + 1.8GHz Hexa) octa-core processor with 8 GB of RAM and 128 GB built-in storage, with unfortunately no option for expansion.